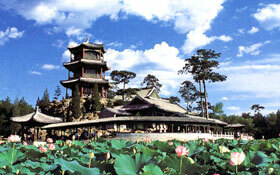 Chengde hotels: discount reservation system offered by chinahotelsreservation. Chengde: exhaustive information regarding accommodation ranging in Chengde, how optimize tours and how choose good solutions for hotels and rooms accommodation. 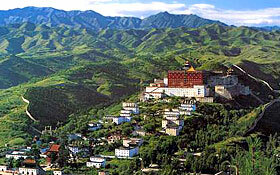 For detailed Chengde hotel information or to reserve a hotel please click on Chengde Hotels list. Chengde is a famous city in north of the great wall which has fine scenery area, it is a tour paradise which the hunting and takes vacation. In this piece beautiful but on mysterious land, has "the world" many, Like world biggest imperial family temple group -- outside eight temples; World biggest wooden Buddha -- thousand hands and thousand eyes Guanshiyin Bodhisattvas; called as a world certainly stone column -- Qing hammer peak. Among them, world biggest imperial family botanical garden summer vacation Mountain village, plain and elegant, the layout is rigorous, in the village the beautiful scene of water and plants, the sight fluttering flags, the multitudinous construction have the different styles, harmoniously unifies actually; The world biggest imperial family hunts of the hunting ground - Mulan magnolia yard, within the boundaries of the yard imperial family hunts of the hunting ground, summer may the leisure summer vacation, the winter be possible to ski the hunting; North abundant rather within the boundaries Beijing first prairie, geography is superior, the scenery is beautiful; The infinitely subtle white clouds ancient hole, the collection of wonderful, the danger, wild and quiet in a body; Within the boundaries of Pingquan County's distant river source forest park, the nature level is clearly and demarcated, the spring, the strange stone and the wonderful tree are converge; The Kuancheng town Panjiakou submarine Great Wall...... Many views coordinate with each other across a great distance, form north Beijing the gold traveling belt.